It’s that time of year again when the Entertainment Software Association (ESA) release their yearly findings on the demographics and make up of the video game industry. The ESA is the foremost gatherer of this type of data and this yearly survey is the most in-depth of its kind. This is important stuff and extremely useful for anyone seeking data on video games and their communities. The Entertainment Software Association (ESA) conducts business and consumer research, and provides analysis and advocacy on issues like global content protection, intellectual property, technology, e-commerce and the First Amendment in support of interactive software publishers. ESA owns and operates E3 and represents video game industry interests on federal and state levels. Yeah, so they’re those people…Them. A better description would be that they’re a organization that gathers pertinent information to better regulate content within the industry by partnering with a lot of the biggest names in the industry. In addition to the ESRB, the group that decides Manhunt is a more mature game than Pikmin (YOU’RE PLAYING WITH LIVES IN BOTH GAMES), they have programs that give scholarships to youths, a board that acknowledges achievements in the industry, and a group of advocates that promote taking action in support of video games. All in all, they’re a pretty cool organization that is making a positive influence on the video game industry. Enough of that jibber-jaber, let’s get to the data! The average age of gamers has increased significantly from last year’s data, which found that the average age of a gamer was 31. What’s leading this change? Could be that mobile games are reaching a larger audience than in previous years. Another thing to note is that percentage of female gamers has actually decreased this year; last year they made up 48% of the gaming population. This change could representative of the sample population, or it could reflect a change in certain marketing over the past year. 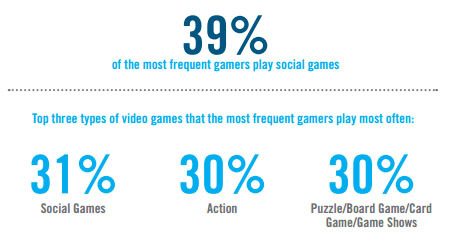 The majority of gamers are social gamers. Gone are the days in which gaming was primarily done by yourself in a dingy basement that may or may not have mold on the ceiling; Now it’s done in the same basement, but with people playing with friends! That said, this makes sense: most major video games now have an online component to them. Only 4 of the top 20 best selling games last year didn’t have a major online component to them, and 3 of the 4 were aimed at children. Games that connect people are on the rise and more than ever we are playing with people across the world. Online communities are now global networks with people working and playing together. You’re next best gaming partner could be a thousand miles away from you. However, I would be interested to know how the ESA defines a social game: Is Super Smash Brothers and social game because it features online play? 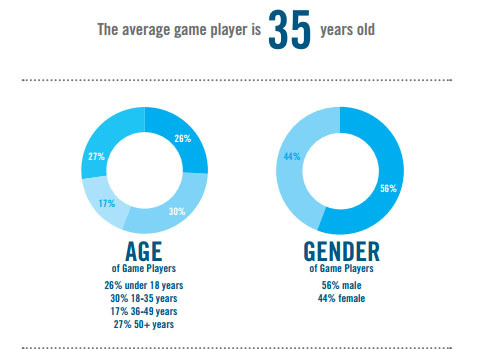 The gaming landscape is still one that is incredibly diverse in terms of themes and age levels. There’s a tend to lump the majority of games in as “mature and violent”, but the majority of video games still are considered family friendly. 11 of the top 20 best selling games last year were rated E or E10+. The relationship between gaming and family is an ever changing one. Parents are learning how to incorporate and monitor the usage of gaming in their children’s lives. 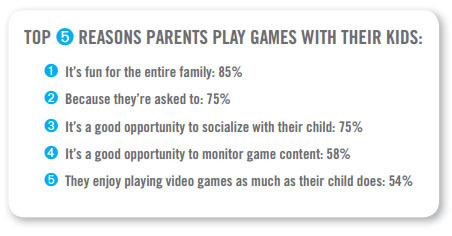 The percentage of parents that monitor the games and hours their children play video games is 91%, up from 87% last year. The influence of video games on children is something we’re gradually getting a better understanding on, so it make sense that year after year parents are becoming more involved in their childrens gaming habits. Lastly, for the first time in the history of video games, digital sales seem to have surpassed physical copies. Keep in mind this is for the industry as a whole (which includes both mobile and PC games), but it’s still an important milestone for the industry. As we discussed, the trend towards digital games raises question about the future of video games preservation. The number of mobile games and digital only games will only increase in the coming years, so you may want to rethink your physical copy library you’ve been creating over the years. All together it’s an interesting year for video game demographics. We’re advancing towards a more inclusive and diverse video game population, but we’re still taking strides. As we see, it’s not always a one way street towards equal demographics, as the numbers and ratios of gamers will flucate over time. In the upcoming weeks I hope to use all of this research to best come up with a picture of the the average gamer and evaluate what insight we can pull from understanding the typical gamer. 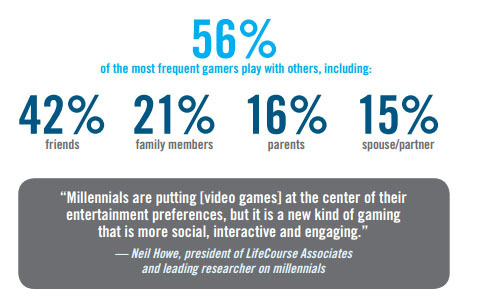 ***Please keep in mind that this data is representative of a survey population and does not neccessarly represent the entire population of gamers. While it is probably the best research and data we have on the subject, a population of 4000 households is still just a survey population attempting to make statements for a population that is increasingly changing and growing. This entry was posted in gaming, video games and tagged esa, Facts, Gaming, sociology, Statistics, Video Games. Bookmark the permalink.